Looking for the perfect gift for a male loved one? This Trifold Genuine Leather RFID Wallet is great for self gifting as well. It is a very stylish wallet, slim design, plus it protects your finacial information. That's something that's very important in this day and time. It helps to minimize electronic fraud and pickpocketing. This wallet is made of fine full grain and 100% genuine leather which means it's not only attractive and stylish but will hold up to everyday use and stand the test of time. 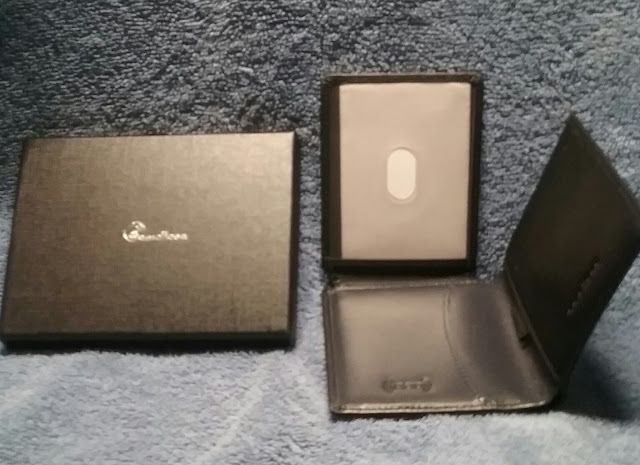 This men's wallet will hold a lot, 10 credit cards, plus has a window for your driver's license or a family photo, a money pocket plus a hidden coin pocket for coins or small items. Even with all this storage it still maintains a slim line so as not to ruin the lines of your trousers. You can wear this in your front pocket or back pocket. I think this would make a perfect gift for anniversary, birthday, Christmas,any occasion such as promotion, graduation, etc. You can get one for your partner or spouse, brother dad, uncle, boss, any male in your life. This is a very well made wallet with reinforced seams and snug fitting card slots. No worries about your cards sliding out of your wallet or about seams coming apart.